With power incline and resistance, the Livestrong LS12.9E elliptical offers on-the-fly toggles on multi-position handles, plus a solid frame, lifetime fitness journal tracking, and Target Heart Rate zone training. The full package has made a big splash for its 2009-2010 debut. The Livestrong LS12.9E elliptical has well-lit LED display windows that show time, speed, distance, watts, RPM, calories, and heart rate. Pre-set programs include intervals with 10 difficulty levels, weight loss, constant watts, random (7 difficulty levels), and THR zone. Unit Weight/Dimensions — 190 lbs; 75" x W: 29" x H: 68"
The Livestrong LS12.9E elliptical’s SixStar Certified™ frame is designed to give you an upright body alignment, narrow foot pedal spacing, flat ellipse stride, and smooth continuous momentum for the most comfortable, ergonomic ride you can experience. The mid-range priced LS12.9E has all the best features you are looking for: a 20" stride, big flywheel, wrap-around handlebars, HR monitoring, 20 levels of resistance, 21 levels of power incline, speakers & mp3 compatibility for music motivation. The innovative Livetrack™ Fitness Journal and integrated heart rate monitor provide an accurate measure of fitness progress over time – no need to write down an exercise log. Just set the date and time, and the journal records your every stride on the trainer – for weeks, or years. Despite the attractive design and advanced features, the LS12.9E has had a few missteps in its short life. Johnson Tech issued a product safety recall on the Livestrong LS12.9E, as well as the LS9.9E and 7.9E, within weeks of their debut in December 2009, due to problems with the pedals becoming disengaged. Elliptical reviews by consumers are also reporting some problems occurring directly out of the box so there are apparently some quality control issues with these machines coming out of China. Nevertheless, the trainer is exciting and offers so many cool features that dealers and customers hope these issues are resolved quickly. This is one of the best new models on the market for 2010. It rates highly for the warranty, ergonomics, and quiet ride. The downsides are the lack of adjustability and the current product recall issue. 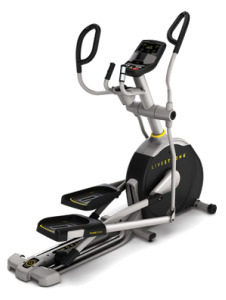 The Livestrong LS12.9e elliptical offers decent value for the $1299 asking price and will likely land on many Best Buy lists in years to come.